Home/Dive Shop, News/Don’t forget your one-of-a-kind adventure in Sabah! Invest in a good quality camera, so you don’t forget your one-of-a-kind adventure in Sabah! 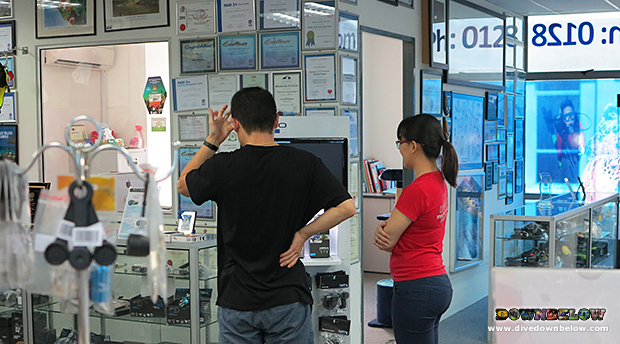 Walk-in guests at our Kota Kinabalu Dive Shop are always curious about our range of GoPro cameras, of which our Supervisor Karen offers the very best, value-for-money, suggestion for which model suits what adventure activity. For example, the GoPro Hero4 Black edition can record footage with minimal light available, such as the last few kilometres climbing Mount Kinabalu from the Laban Rata plateau to the Lows Peak summit in the early hours of the morning! Karen can demonstrate how to set its ‘night mode’ feature so our climbing guests can capture the beautiful stars in the clear night sky. For those climbers who reach the summit early, while waiting for the sunrise a time lapse of the breaking dawn offers spectacular footage – and looks really professional too! Karen is also really adept at what GoPro accessory suits which activity best also; whether you’re joining river cruises along the Kinabatangan River for a wildlife safari, or learning to scuba dive at our premier PADI 5 Star IDC Dive Centre, there’s an accessory to complete your GoPro experience! Get in touch with Karen for more details on our GoPro range of camera models and accessories, or get more information from your Sabah Travel Centre expert when you discuss a personalised itinerary!